What Day Of The Week Was January 2? 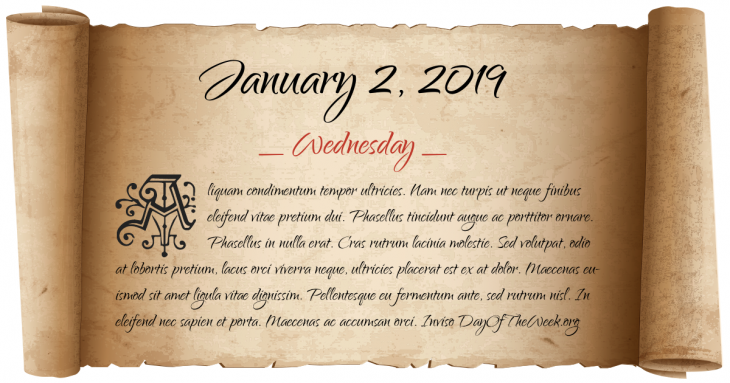 January 2, 2019 was the 2nd day of the year 2019 in the Gregorian calendar. There were 363 days remaining until the end of the year. The day of the week was Wednesday. Leaders of armed opposition declare the President Zviad Gamsakhurdia deposed during a military coup in Georgia. Eduardo Duhalde is appointed interim President of Argentina by the Legislative Assembly. Who were born on January 2?